Ball(s) to the Wall: "Long December"
You would think having spent the past 5 days in the hospital, going to sleep when you get back home would be a breeze. But, alas I'm sitting here in the living room watching Sports Center on ESPN. For some reason I find it more comfortable to just be sitting, as opposed to laying in bed sound asleep. There are a million things weighing on my heart right now, and my brain won't turn off long enough for me to sleep. I had never been so scared to go to sleep as I was on Wednesday night. When I got brought to the hospital I don't remember anything that happened from the time I was taken back to the ER room until I arrived at Vanderbilt. The one thing I do remember as I was making it onto the bed is telling myself not to fall asleep. I was scared that if I did fall asleep, I wouldn't wake up. I have too much going for me right now to have it end so soon. I'm a husband, a big brother with a sister that thinks the world of him, with another brother that couldn't call me every time the colts scored. I am someones son, grandson, friend. But, it wasn't my time. So I sit here tonight, writing to two, trying to put together exactly why (on a spiritual level) this happened. I have always tried to live my life to be the best "person" I can be. I don't put on fronts, what you see is what you get. My wife and my family are the most important people to me, and I would do anything for them at the drop of a hat (they've been doing the same for me). The one problem that I have with myself, is that I continually tell myself that I am going to start spreading the word of God, and never follow through. When I started my chemo over the summer, I would sit in my room and think of ways that I could relate to different people through cancer, then show how God's healing power helped get me through my hard times. I thought about how I take my testimony to different places to help raise awareness for TC. 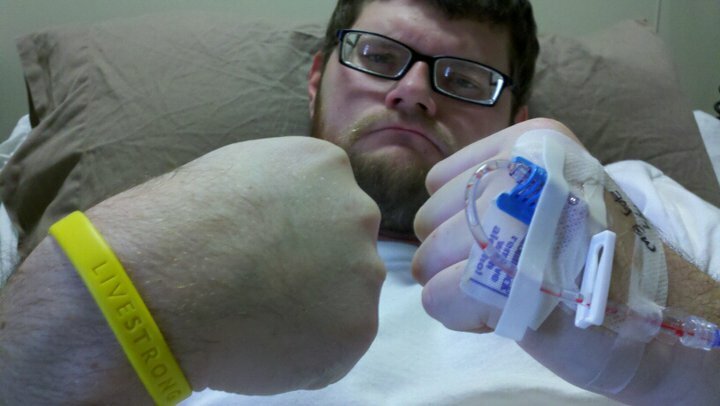 But once I was told my tumors markers were (at the time) normal, I just put God on the back burner. It was time to get back to life. I now know differently. I realize why I was given this wakeup call. I was asked on two different occasions by two different men at Vanderbilt how I found my testicle had a tumor. And the fact that I got asked twice about my cancer in the period of 24 hours proves that God is using me to help raise awareness. And I have a strong feeling that is what I need to be doing with my life. I need to start an organization and have focus and support groups that are available at anytime to answer the questions that are specific to TC.